A plump Eastern spadefoot toad sits placidly in a patch of meadow on Cape Cod, Massachusetts. Nearby, researchers Rachel Jania and Bryan Windmiller are on a house hunt, trying to figure out if the meadow might make a good home for the rare toad, whose habitats have been devoured by development. They wait to see whether the full-grown male, weighing less than one ounce, will burrow underground, where spadefoots spend much of their lives, emerging only to mate. Once plentiful throughout the Northeast, the Eastern spadefoot almost disappeared from southern New England during the 20th century. The meadow used to be farmland. The soil is so dense and loamy that the spadefoot (it gets its name from the projection on its hind leg that it uses as a tiny shovel) may not be able to tunnel below. Once plentiful throughout the Northeast, the Eastern spadefoot almost disappeared from southern New England during the 20th century. 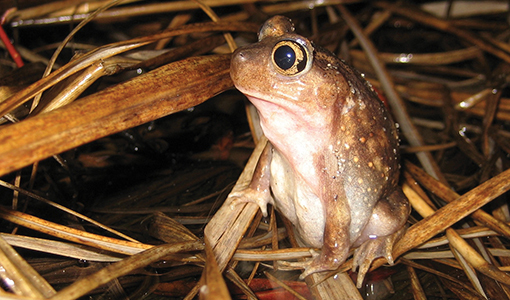 Today, they are the rarest amphibian in Massachusetts, Windmiller says. The breeding pools—ecologists call them vernal pools—are basically rain puddles that appear and then evaporate in the spring. During their brief forays above ground, the spadefoots mate and lay their eggs in the pools. The toads were plentiful when the New England landscape was dominated by forests and farmland—and even when the roads in Boston and Cambridge were rutty and unpaved. With a grant from the U.S. Department of Agriculture, Jania had planned to study how the toads of Sandy Neck select ponds in which to mate. But for the first time in six years, the toads didn’t breed last spring, which Jania attributes to the unusually dry season. “It’s not that uncommon. If there’s not enough rain at the right time, they just won’t breed,” she says. So she shifted the focus of her research and began investigating potential spots to relocate spadefoot toadlets that Mass Audubon scientists raise—a process known as headstarting—in vernal pools restored to the condition they were in before the European colonists arrived in the 1600s. Over the past few years, Ian Ives, director of the Long Pasture sanctuary, has overseen the construction of six breeding pools there and four more at the Ashumet Holly Wildlife Sanctuary in Falmouth, Massachusetts. More than 6,000 spadefoots have been head-started and released on the two Audubon sites, thanks to the collaboration with Grassroots Wildlife. But not much is known about the fate of those toads. So Jania worked with Eric Baitchman, head veterinarian at Zoo New England, to implant tiny radio transmitters in three toads from Sandy Neck. Once they healed up, they were released at the Falmouth sanctuary. As long as the transmitter batteries have juice—about six months or so—the researchers will be able to tune into each toad and know exactly where it is and what habitats it prefers. Plenty of questions remain, among them how long before the toads are ready to breed. Windmiller estimates that Eastern spadefoots live up to 15 years and that they are juveniles for about five years. They won’t turn up at the breeding pools until they are sexually mature, “which means you let them go as newly transformed little toadlets and you just have to hope for five or six years that they are doing OK,” he says.